PHOENIX – Virtual doctors visits connecting patients and physicians who are miles apart are increasing, but insurance coverage hasn’t caught up with the move toward telemedicine, Arizona doctors and lawmakers say. A proposed law would expand insurance beyond the sliver of conditions that are covered now. Private insurers are required to cover telemedicine care in only 11 specialties, including trauma, mental health and cardiology, and even those are limited to rural areas. AHCCCS, the state’s version of Medicaid, also has coverage limits. Those eligibility restrictions leave out most Arizona residents and common illnesses treated by primary-care doctors. Arizona lawmakers are pushing for coverage equality in telemedicine so people in underserved areas have easier access to care and lower costs. “Providing virtual care allows you to touch the patients to the closest place of their comfort, so it’s not just rural, it can be elderly – someone can be just as isolated anywhere,” said Gigi Sorenson, chief clinical officer at GlobalMed, a Scottsdale company and one of the largest distributors of telemedicine devices. Sen. Heather Carter, who introduced Senate Bill 1089, lamented the lack of coverage equality, saying it places Arizona behind other states. The Senator is also an associate director at the Arizona Center for Rural Health. “The entire country has pretty much leapfrogged us,” the District 15 Republican said at a hearing in February. Arizona added urology to the list of covered specialties just last year, Carter said, because statistics showed that Yuma County only has four urologists in a more than 5,000-square-mile area. The bill would allow Arizona patients using telemedicine to “be reimbursed for everything that is covered by your health plan,” Carter said. A major gap in health care coverage in telemedicine exists in primary care, the medical area most familiar to patients through annual checkups and sick visits. One of the fastest growing states by population, Arizona only meets about 42 percent of its primary care physician needs, according to the Arizona Center for Rural Health. Most of those doctors are in Maricopa and Pima counties. In Yuma, Santa Cruz and Cochise counties, a shortage of primary care doctors affects more than 75 percent of residents. The effects of telemedicine coverage limits and opportunities are most apparent in rural areas. GlobaleMed’s Sorenson said transportation is a major barrier to regular medical care for people in rural or underserved areas. Just making an appointment may involve taking a day off work. Dr. Bart Demaerschalk, a professor of neurology at the Mayo Clinic in Phoenix, said telemedicine can reduce costs by eliminating emergency air and ground transportation. Doctors can evaluate patients’ situation remotely while paramedics are treating them in their home. For Ajo residents, the nearest emergency room is at Sells Indian Hospital, 70 miles away. The next best options are 80 and 100 miles away. The town’s only clinic offers a range of services from X-rays to dental services. Because Ajo is in Pima County, which has a population of more than 1 million, Ajo residents aren’t eligible to receive telemedicine services through private insurers. The law defines “rural” as a county with fewer than 400,000 people. Arizona has 48 medically underserved areas and only 25 are considered rural, meaning several urban areas across the state do not have access to a full spectrum of comprehensive care either. Telemedicine expands access to specialists or higher-level care providers to patients from their local clinic or from their home, Sorenson said. Virtual care, introduced in the 1990s with the dawn of the internet, is gaining traction. The Centers for Medicare and Medicaid Innovation in February proposed a model that would expand Medicare coverage of emergency ground transportation to the most appropriate medical facility, including treatment on the scene using telemedicine. Dr. Charles Miles, an emergency room physician at Wickenburg Community Hospital, said air transport from rural areas to metro Phoenix can reach $40,000. Telemedicine also saves the time it takes to treat patients in a medical emergency, he said. Even if a helicopter can transport a patient to Phoenix in 20 to 30 minutes, first responders have to prep the helicopter for dispatch, load the patient and allot for delivery time. The more distant the help, “the worse your outcomes are going to be,” Miles said. Demaerschalk demonstrated other uses for telemedicine at a Senate committee hearing last month. 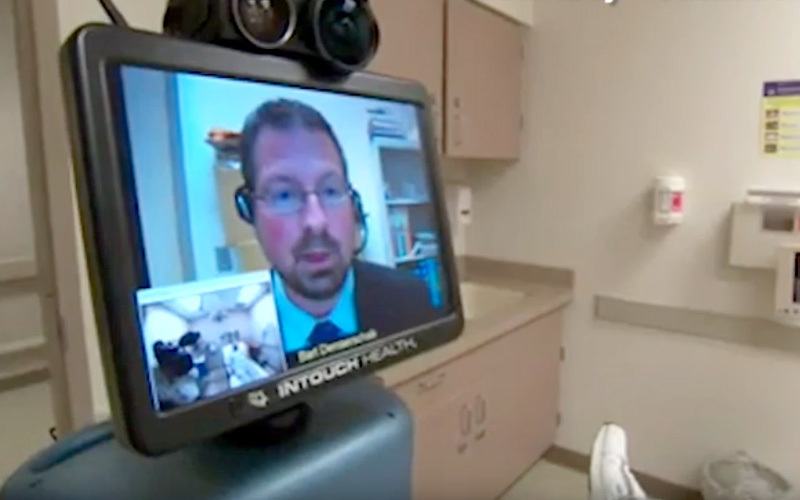 Using a stand-in as a patient, he simulated a live patient appointment in Rochester, Minn., that he conducted from his laptop in Phoenix. Zooming in on the patient to examine her eyes, he could see whether her pupils dilated in the presence of light. He also showed lawmakers the exam room’s Bluetooth stethoscope and an otoscope – everything he would use in an in-person visit, through the computer screen. Then, from the Capitol, Demaerschalk guided a robot through the halls of Mayo Clinic’s emergency room in Phoenix. Telemedicine can take place in real-time, with a doctor exchanging information on live video with other professionals around the country to reach a diagnosis. Another type of medicine, called “store-and-forward” is the same sort of exchange but is not done live. Arizona law doesn’t cover that kind of telemedicine either, according to SB 1039. Telemedicine can’t be used in every case, advocates acknowledge, and some concerns about patient privacy were raised. Demaerschalk said telemedicine, along with all forms of care, must follow strict privacy and security regulations to protect patient data. “Every one of these technologies – those deployed by our health system and other health care systems in our state – meet the highest and most rigorous of health care privacy standards with data encryption,” he said. Demaerschalk compared telemedicine’s privacy measures to the encryption of financial data in banking, government data and military data.